This adaptation of Jim Thompson’s chilling 1952 novel has stirred controversy since walkouts occurred during its Sundance screenings this year. Word was that it was faithful to its source. That is undoubtedly true, perhaps to a fault. The film is uncompromised, uncompromising and ultimately unsuccessful. Yet despite its flaws, I’m finding it awfully hard to shake. Lou Ford is a deputy sheriff in Central City, Texas. He’s also a high-functioning sociopath who has managed to hide his derangement for years, even from his steady girlfriend. In order to exact revenge against the town kingpin (Ned Beatty) he sets into motion a plot that starts with Lou murdering a prostitute he himself has been sleeping with. But nothing goes according to plan, and the blood continues to flow. Thompson’s novel is not a descent into madness. It can’t be, because Lou is already there. It’s a brief ascent into lucidity. Lou Ford knows that something is wrong with him, and is intensely curious about what it might be. That sense of self-observation, of a man watching himself with great if detached interest, has no obvious cinematic correlative, putting any film version behind the eight-ball from the start. 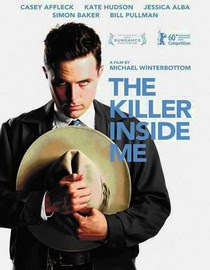 Director Michael Winterbottom and screenwriter John Curran hew very closely to the book in what Winterbottom himself calls a “very literal film.” It’s as if they believe that because Thompson’s prose is so spare, even stark, Lou’s story is to be taken at face value. But this approach is essentially playing the notes and not the music; as Bertrand Tavernier, who made the finest Thompson adaptation with Coup de Torchon, observes, there’s a metaphysical element to all of the author’s work that’s too often ignored. The violence is brutal, callous, and almost impossible to watch. It’s also exactly as Thompson describes it. More to the point, though, it’s exactly as Lou Ford describes it. He’s an unreliable narrator, so maybe we don’t believe him when he claims that the women involved not only refuse to defend themselves but profess their love as the blows rain down. And the film’s increased emphasis on the sadomasochistic nature of the relationships has the unpleasant side effect of suggesting that the women are complicit in their fates. Still, this is a serious, thoughtful adaptation, and the filmmakers deserve credit for sticking to their point of view to the bitter end. Plus they get so much right. The movie looks terrific, nailing the period, the place, the desolation. Casey Affleck gives a fearless performance as Lou Ford, hiding a host of demons behind a boyish, placid mask. The offhand manner with which he delivers the most disturbing moments – his parting words to Jessica Alba’s Joyce amidst his attack on her, telling a fellow deputy not to say anything because “I haven’t given you any lines” – only heightens their effect. And the supporting performances are first rate, like Elias Koteas as a cunning union leader and especially Bill Pullman’s barnburner of a late cameo, spouting dialogue straight from Thompson’s book (“A weed is a plant out of place”). It’s not a perfect film. But it’s one I won’t soon forget. The movie opens in theaters on June 18 but is available via IFC On Demand now. I’ll echo what was said in the last issue of the Film Noir Foundation’s Noir City Sentinel: by releasing this film and the Red Riding trilogy, IFC has proven that it’s the best hope for contemporary film noir in America. UPDATE: I watch the 1976 film version here.